Soap Monkey - Handcrafted soaps from Kitchener Ontario! Wonderful soap, as always! Dependable quality and great customer service. Sara's soap lasts a long time, so we haven't used this one yet! It smells amazing, though, and it's just as attractive as the rest of her soaps. I'm confident that this will be just as effective and long lasting as the rest of her products. Thanks, Sara! This soap is a hit in our family. Like the Baby Soft Calendula Soap, this leaves your hands softer after you use it, with a mildly exfoliating element from the sea salt. It's effective, smells great, and lasts a long time. I will definitely be purchasing this again! This cedar deck does exactly what it's supposed to do. The deck smells great and definitely lengthens the lifespan of your soap. It's well finished and also super easy to clean! Our hands definitely feel softer after using this soap, even after a long day when your skin has a texture similar to sandpaper. Has a lovely smell and a long lifespan, particularly when you use her soap decks! Actually arrived sooner than expected, which was a nice surprise. Very fast shipping. The soaps very well made, hard, good lather with a good selection of varieties. Will be back for more. 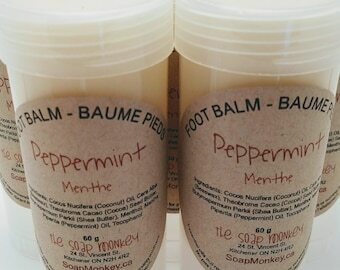 I always make a special peppermint soap for the holidays! Stayed tuned for this year's creation! My favourite part of the process - slicing the soap! Welcome to my Etsy shop! My name is Sara... although some folks know me as the Soap Monkey. :) By day, I work in my community in the not-for-profit sector. By night, I make soaps and potions in my kitchen! For me, this is a labour of love. I sell my products to continue funding my soap-making addiction. I'm always learning, always experimenting... and having lots of fun doing it. I hope you get as much joy of out of using my products as I do out of making them! Due to the nature of handmade bath products, I can't accept returns. If you have any concerns about a product, please connect with me and I'll do my very best to make it right! If an item is in stock, I'll ship it within three business days. Often it's the next business day. Please note: Shipping is MUCH more affordable when you're ordering multiple products. CUSTOM ORDERS - Looking for party favours for your special event? Message me!